TORONTO - Zannat Reza says the worst part of packing school lunches is when the food is brought home uneaten. "For me it's the most worrisome because it's like OK, what have you eaten all day and how can you learn? You're there to learn and have fun with your friends and eating healthier food is part of that," the registered dietitian says. To remedy the situation, she has found that sitting down with her two children to map out the week's lunches helps enormously and teaches them a life skill. "That way they have some input and they're more likely to buy into it and eat the food if they've had a say," she says. "But that doesn't mean if they're saying chips and chocolate that that's what you should pack. There needs to be some sort of guidelines around that." She posts the menu for the week on the fridge so her nine-year-old daughter and six-year-old son know at a glance what they can expect to eat. If children bring food home, trouble-shoot to find out why. Perhaps they didn't have enough time to eat or a sandwich might have been soggy, for example. Reza learned to her chagrin this summer that her son couldn't open a container she'd sent with him on a camp day. "I also have to put it in perspective because it's not the only meal of the day. They have had breakfast and we always have a good after-school snack as well," such as fruit and milk, a home-baked muffin or whole-grain crackers and cheese. When planning lunches, include protein, a fruit or vegetable and a whole grain to round out the meal. Protein at lunch "will keep them full and energized to last them all afternoon," she says. Roast chicken, turkey or beef, eggs, chickpeas or baked beans are great lunch ideas. "When I make dinner I usually make a little extra because dinner leftovers are awesome in terms of something that's fast and easy and it's done." Kids also love picnic-style lunches. Muffin tin liners can be used in the lunchbox to separate grape tomatoes, cucumber coins, whole-grain mini pitas and a hard-boiled egg. Put together a stash of fast, easy, grab-and-go lunch things — cut-up vegetables, grape tomatoes, fruit that's easy to eat out of hand like apples and bananas, fruit cups packed in juice and little boxes of raisins or dried cranberries. It's easy to create a lunch kit that mimics commercial varieties with whole-wheat crackers, cubes of real cheese and home-roasted turkey slices. Doing some prep work on the weekend and the night before means the meal can simply be assembled in the morning rush. "I like hard-cooked eggs. If you do up a whole bunch on the weekend they will keep in the fridge for up to one week as long as you keep the shells on," Reza explains. The best drinks for lunch are white or chocolate milk, water and 100 per cent fruit or vegetable juice. Fruit punches or cocktails are drinks that masquerade as juice and "those are basically like drinking pop without the fizz," says Reza, who's been a dietitian for 16 years. "They're just sugar. Even if it says made with real fruit juice you have to make sure it's 100 per cent juice." Food safety should be top of mind when packing lunches. "Keep cold foods cold and hot foods hot. Even though it's only a few hours bacteria can multiply. Any perishable food that comes home should be tossed, not saved," Reza says. Juice boxes can be frozen and used to keep other lunch items cold. To keep hot food at a safe temperature until lunchtime comes around, fill an insulated container with boiling water and let it sit for a few minutes to let it really heat up, then discard the water and add piping-hot food. Reza says her nine-year-old daughter helps by boiling the water. 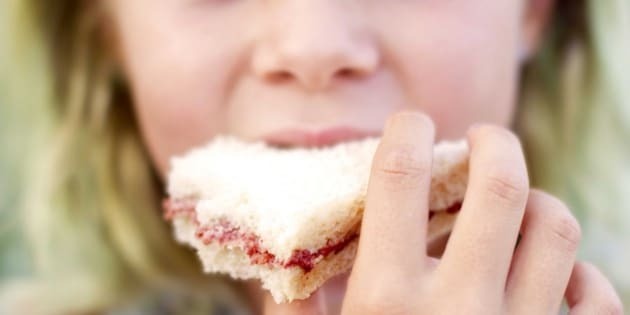 Another challenge she and other parents face is that children may want to tote items like chips or cookies that they see other children eating. Reza, who focuses on nutrition communications in her company Citrus, tries to turn that conversation into a learning opportunity by explaining that other families have different rules but what they are choosing will give them energy to learn and have fun with their friends. Learn to read ingredients and nutrition labels on packaged goods. Parents are busy and rushed and sometimes it's easy to go to the grocery store and pick up what has been labelled as a great snack or lunch idea, but Reza advises that they are more like treats. The first ingredient is often sugar or a refined enriched wheat flour, which is not a whole grain. She has noticed a lot more marketing of nut-free or peanut-free items "but just because it's peanut-free or nut-free doesn't automatically make it healthy." If you want to send in a treat to school for a birthday, then those peanut-free options are great, but not on a daily basis. "It's OK to add in a little treat now and then, but I don't think kids need a treat in their lunch every day," she adds. Among her lunch paraphernalia, Reza has separate containers for the kids, small ice packs, insulated vacuum containers, lunch bags and inexpensive cutlery so that if a piece goes missing it's not from her good set. Now, in the lead-up to school, is the time to check over all the gear. If you need to buy or replace something get the kids to accompany you to the store so they'll be part of it and be excited.